Dr. Shirley Raines autographs a copy of her book for Luther McClellan. acknowledging the history-making trailblazers who shattered the color barrier in 1959: Luther McClellan, Marvis Kneeland Jones, Ralph Prater, John Simpson, Bertha Mae Rogers Looney, Eleanor Gandy, Rose Blakney-Love and Sammie Burnett Johnson. 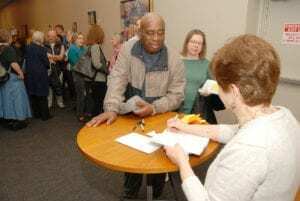 She pointed out two of them among the audience – McClellan and Looney – who came to hear her expatiate on her new book during a book talk and book signing Jan. 26 at Novel Memphis in the Laurelwood Shopping Center. “The stories are told from the experiences that you helped me live,” said Raines, speaker, consultant and author, interacting with the surrounding audience. The Memphis State Eight gets a nod in the book. She first recognized the significance of their rightful place in history and hosted a former dinner and reception in their honor on campus in 2006. A historical marker was erected in front of the Administration Building in 2012. Much of the credit goes to Markhum “Mark” L. Stansbury Sr., then special assistant to Raines and a longtime luminary over the airwaves at 1070 WDIA. He didn’t want the group to be forgotten and their determination to pursue a college education under dire conditions to be omitted from the annals of history. “Dr. Raines was really a great president. She was sincere and open to change. And I appreciate her sincerity,” said McClellan, who left Memphis in 1962 during his sophomore year at the university. “It’s amazing. 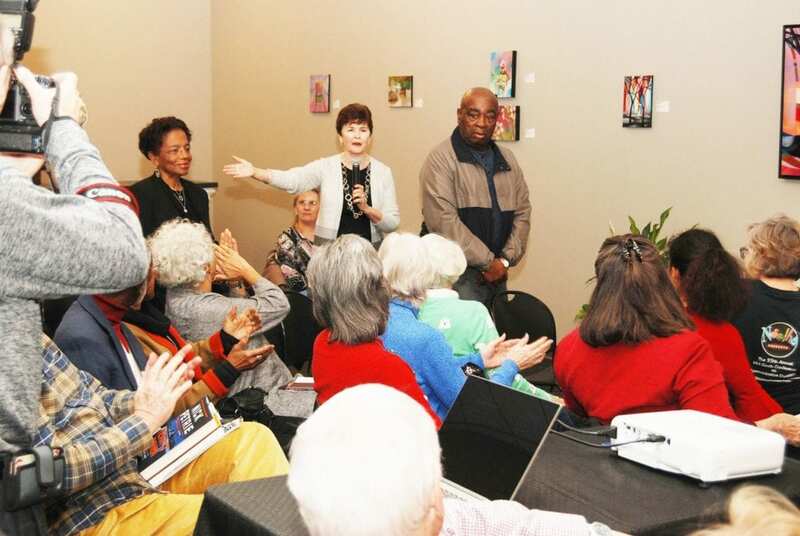 It’s overwhelming,” added Looney, acknowledging the attention the group has been receiving and the “small contribution” that she said she’d made during that turbulent era in Memphis’ history. “They mean so much to me,” said Raines, recognizing her supporters and others in the audience (including Stansbury) who helped to shape her career as a leader and an academic. She rose from humble beginnings on a sharecropper’s farm in Bells, Tenn., to serving a stint in early childhood education, to serving at the helm of the university as its first female president. Bells is a quaint city in Crocket County, Tenn., 72.9 miles from her home in Memphis “to be exact,” said Raines, who first eyed the big city of Memphis while growing up in Bells. Born on the farm, Raines’ hardworking parents didn’t quite see the sunny side of an education after high school. Her mother had a 12th-grade education, she said, and her father made it to eighth-grade. “I wrote this book to tell my stories, and to inspire leaders, especially aspiring women leaders, who are wondering if they should take their next leadership step,” Raines explained in the book’s preface. She’s had some invaluable experiences and life lessons on her journey from Bells to Memphis and developed the skillset that would catapult her as a formidable leader tasked with an awesome responsibility. This is the crux of the book. The manuscript started out at 600 pages, she said, “but my editor said nobody would buy it. So I cut it to 300 pages.” Then she whittled the book down again to about “170-something” pages. The book starts out with Raines’ formative years and builds from there until she lands the big enchilada at the U of M that naysayers, including her husband, didn’t think she would be selected. She did it her way and set the U of M on a trajectory going forward. She created The Benjamin L. Hooks Institute for Social Change, for example, and raised millions for the U of M Community Health Building. “It was a great university before we got there, but we made it better,” Raines said unapologetically, owing her success to the life-lessons she learned over the years and her ability to lead the way. “I always thought Dr. Raines was a great person. But on yesterday (Jan. 26), her stock went up with me,” said Stansbury, who shared the same sentiments about Raines with his radio listening audience.